Room 21: Will Marty Be Able To Keep His Secret? During the month of November we finished the book Shiloh written by Phyllis Raynolds Naylor. The book is about a beagle named Shiloh who is found wandering around by a boy named Marty. Judd Travers owns Shiloh, but he doesn’t treat him right. He even names his dogs by numbers and hurts them if they don’t do something right. Marty secretly hides Shiloh for weeks and decides to not give him back. Will Marty be able to keep his secret and keep Shiloh? You will have to read to find out! 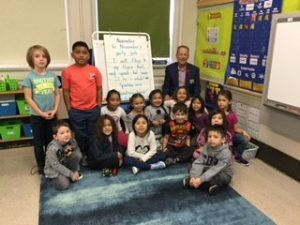 Thank you for reading Room 21 news. We hope you will give the book Shiloh a try! 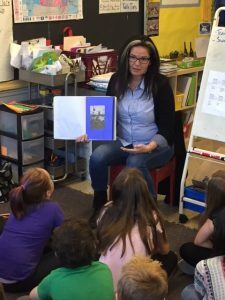 During the month of November, in room 12, we talked a lot about Remembrance Day. 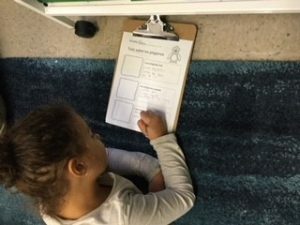 We wrote about what we remember during Remembrance Day. 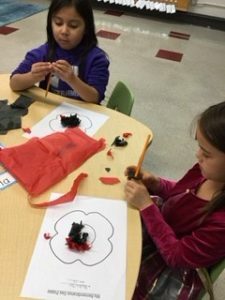 We decorated poppies for our school assembly. Veteran Art Brown visited our classroom and talked about his experience and answered our questions. Durante el mes de noviembre, en el cuarto 12, hablamos mucho sobre el Día de la Recordación. Escribimos sobre lo que recordamos durante el Día de la Recordación. Decoramos amapolas para nuestra asamblea. Veteran Art Brown visitó nuestra clase y habló sobre su experiencia y respondió nuestras preguntas. This month we have been learning all about 2D shapes and 3D objects. We know how to compare them by size, shape and colour. We collected different 3D shapes to build something for our class. 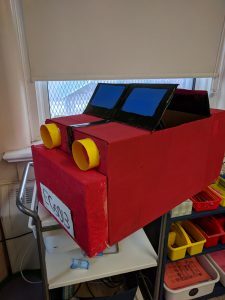 We voted to build a car. We aren’t quite finished yet but it’s looking good so far! We have been practicing our 3D shapes poem a lot. Some of us are even able to read it all by ourselves! Wow, we have done a lot of exciting things this month! For instance we have started working in expert groups as part of our study of Earth and the Solar System. There are six groups: the sun, constellations, the stars, asteroids and comets, personned and unpersonned space travel (we don’t like manned and unmanned) and the moon. No, actually we mean moons (plural). In the Grade 6 Math class we have been working on Heads and Legs problems. We are also working on integers and made a giant number line with both positive and negative numbers. The Grade 5s are working on multiplication and division. Our Grade 4s are busy solving area and perimeter questions. Room 27 had three members of the Earl Grey Eagles for Equality attend Everybody has the Right held at the Canadian Museum for Human Rights. 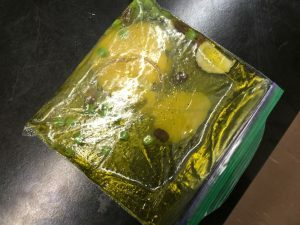 We did several activities on the topic of belonging. 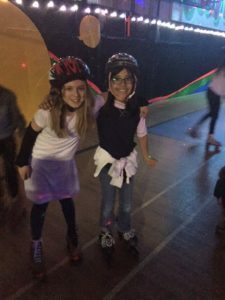 There are many patrols and CMs in our class that went roller-skating or roller blading at Wheelies this month. 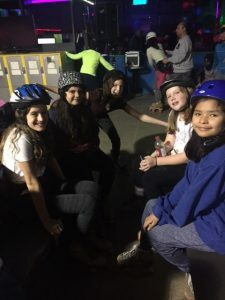 Many of us fell but we still had fun! We are happy to have Ms. Spring as a student teacher in our classroom! 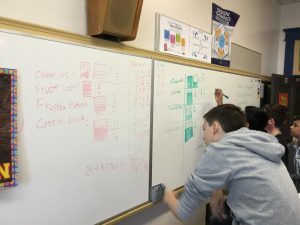 October was a Great Month in Junior High! 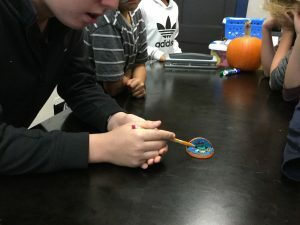 October has been a fun and exciting month in Junior High. 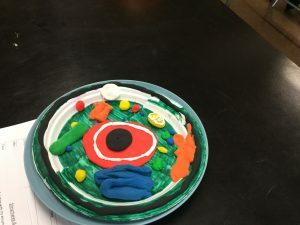 In science, to learn about cells, we were asked to create cell models. 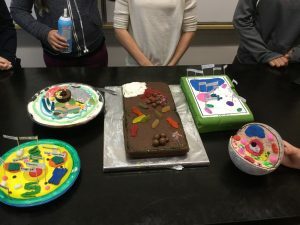 Everyone was very creative when making their models, some groups even made their models edible! 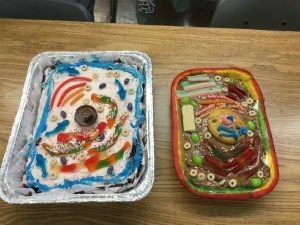 Overall it was a great and tasty way to learn about cells. Lately, in math we have been learning about fractions, so to end it all off, we made fractional cupcakes! Baking has many fractions involved, as we learned when we baked the cupcakes, so it was a great way to finish off the fractions lesson. Meanwhile, in language arts we have just finished the riveting story of The Outsiders, by S.E Hinton. 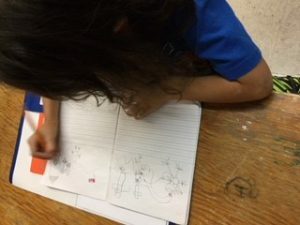 We made news broadcasts based on the story and we are now learning about the literary devices and how each story uses them uniquely. 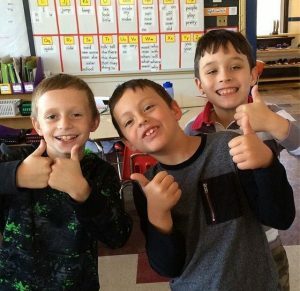 In social studies class we have been taking notes and studying up for a test, we also recently started learning about the Treaties that played a huge part in shaping Canada to be what it is today. Finally, many of the junior high students, along with our Earl Grey Eagles For Equality, took a trip to the Bell MTS centre for WE day! WE day was definitely a fun and inspiring experience, we got to hear stories from people who have decided to make a difference in our world, and we were inspired to make a difference as well! October was a great month here in Junior high, we can’t wait to see how exciting November will be! 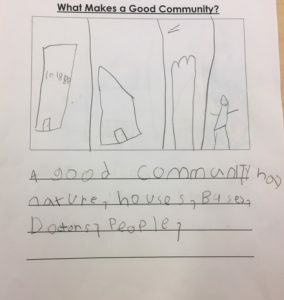 Room 22 Thankful for our Community!!! 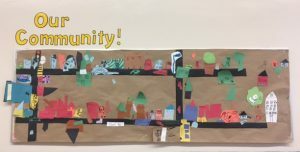 For our final project in our inquiry on our local community, Room 22 decided to make a map of all the features of our community. 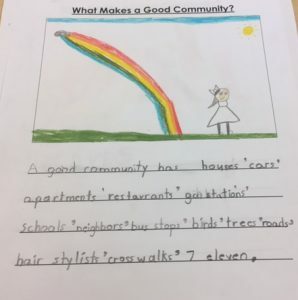 We had a great time remembering all of the highlights from our community walk including our school, restaurants and other businesses on Corydon, Laverendrye School, houses, apartments, bus stops and even the people. 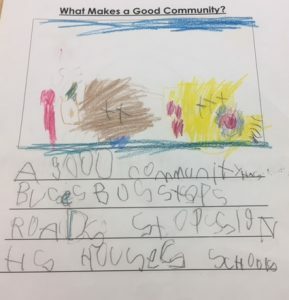 We talked about how important each feature of our community is and how people can help others in the community including helping our neighbours look for a lost pet and cleaning up the environment. We know that a community is a place where people live, work and play and we’re happy to be an important part of ours.